The Toyota RAV4 is a versatile SUV that’s great for everything from camping and family road trips to your daily commute. With lots of cargo room, safety, and useful features, it’s a dependable option for all kinds of drivers around Avon, Indianapolis, and Plainfield. Leasing is a great way to get behind of the wheel of this beloved SUV. When you’re interested in Toyota RAV4 lease deals, visit the team at Andy Mohr Toyota. On our lot, you’ll find a great selection of Toyota RAV4 models to choose from. With six stylish trim levels, four hybrid trims, and dozens of vehicles in stock, you’re sure to find the SUV that features everything you’re looking for. Each one will be able to accommodate lots of cargo for you. The trunk offers 38.4 cubic feet of space for your belongings. Plus, the second-row seats can fold down to give you up to 73.4 cubic feet of cargo room. 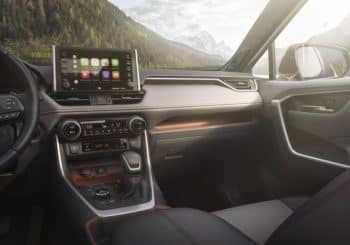 On top of being able to carry all your bags, the interior also features an infotainment system with voice recognition and Bluetooth®, so you can stream your music and safely take hands-free phone calls. Speaking of safety, every Toyota RAV4 is designed to protect you and your passengers with eight standard airbags and the driver assistance features in the Toyota Safety Sense™ P system. With this design and technology watching out for you, the Toyota RAV4 has been awarded with a 5-Star Overall Safety Rating from the National Highway Traffic Safety Administration (NHTSA) every year since 2015. You can read more on the RAV4 safety ratings on our site. In addition to its safety and cargo room, there are lots of perks to leasing a Toyota RAV4. For one, it’ll save you money. When you sign a lease term, you’ll only be financially responsible for the time when you have the car instead of its full value. This means you’ll usually have lower monthly payments and won’t have to make a down payment. The second benefit is how easy leasing makes it to upgrade. Every two or three years, you’ll be able to start a new lease with a brand-new SUV that has all the latest features. It’ll also give you a chance to conveniently switch trim levels, too. 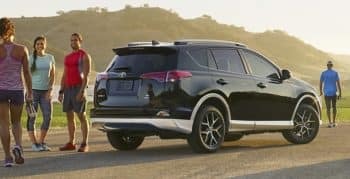 By signing a lease for a Toyota RAV4, you’ll get to save money on a reliable, new SUV and swap it for the latest model every couple of years. Visit the finance center at Andy Mohr Toyota to learn more about our great Toyota RAV4 lease deals. 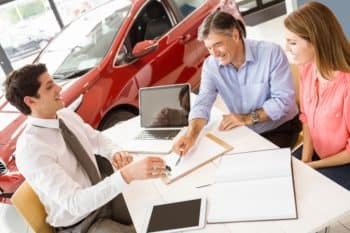 We have a knowledgeable team of financial experts who are dedicated to helping you drive around Avon, Indianapolis, and Plainfield in the SUV that you want. Contact us or stop by sometime to learn more about our Toyota RAV4 lease specials.